Ottawa, ON, July 17, 2017 – According to statistics released today by The Canadian Real Estate Association (CREA), Canadian home sales cooled further in June 2017. National home sales dropped 6.7% from May to June. Actual (not seasonally adjusted) activity in June stood 11.4% below last June’s level. The number of newly listed homes edged back by 1.5% from May to June. The MLS® Home Price Index (HPI) was up 15.8% year-over-year (y-o-y) in June 2017. The national average sale price edged up just 0.4% y-o-y in June. The number of homes sold via Canadian MLS® Systems fell 6.7% in June 2017, the largest monthly decline since June 2010. 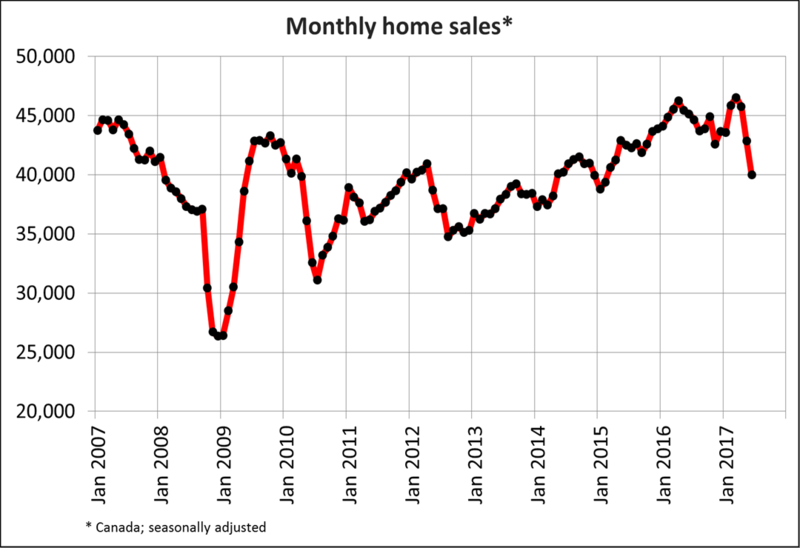 With sales having also declined in each of the two previous months, activity in June came in 14.1% below the record set in March. Canadian homes sales in June were down from the previous month in 70% of all local markets, led overwhelmingly by the Greater Toronto Area (GTA). Monthly declines were also posted in all surrounding Greater Golden Horseshoe housing markets, the Lower Mainland of British Columbia, Kingston, Montreal and Quebec City. Actual (not seasonally adjusted) activity was down 11.4% on a year-over-year (y-o-y) basis, much of which reflected a significant drop in GTA sales activity. Nonetheless, half of all local housing markets recorded y-o-y sales declines. By contrast, Calgary, Edmonton, London and St. Thomas, Ottawa, Montreal and Halifax-Dartmouth topped the list of Canadian cities where home sales surpassed year-ago levels. The number of newly listed homes slid 1.5% in June, led by a sizeable pullback in the GTA compared to record levels in April and May. A number of other markets in the Greater Golden Horseshoe also saw a pullback in new supply. With sales down by considerably more than new listings in June, the national sales-to-new listings ratio moved further into balanced market territory at 52.8%. The ratio had been in the high-60% range just three months earlier. The ratio was above 60% in fewer than half of all local housing markets in June. The majority of markets with a ratio above 60% are located in British Columbia and Ontario, but a number of Greater Golden Horseshoe markets have downshifted into balanced territory. The ratio fell below 40% in the GTA and Barrie. 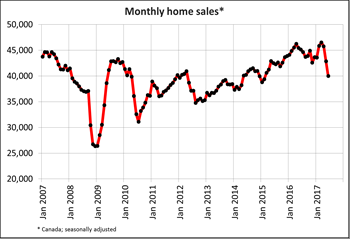 There were 5.1 months of inventory on a national basis at the end of June 2017 – up a full month from where the measure stood in March and the highest level since January 2015. Months of inventory in the Greater Golden Horseshoe region are up from the all-time lows reached prior to the Ontario government housing policy changes announced in April 2017. For the region as a whole, there were 2.5 months of inventory in June 2017. While this remains below the long term average of just over three months, it is up sharply from an all-time low of just 0.8 months set in February and March. Across markets in the region, months of inventory ranged from 1.5 months to 3 months in June 2017. As such, housing markets within the Greater Golden Horseshoe remain the tightest in Canada together with those on Vancouver Island and B.C.’s Lower Mainland. The Aggregate Composite MLS® HPI rose by 15.8% y-o-y in June 2017, representing a further deceleration in y-o-y gains since April. Price gains diminished in all benchmark home categories, led by single family homes. Apartment units posted the largest y-o-y gains in June (+20.4%), followed by townhouse/row units (+17.4%), two-storey single family homes (+15.4%), and one-storey single family homes (+12.3%). While benchmark home prices were up from year-ago levels in 11 of 13 housing markets tracked by the MLS® HPI, price trends continued to vary widely by region. Benchmark home prices in the Lower Mainland of British Columbia have been recovering after having dipped in the second half of last year. While y-o-y price gains continue to slow (Greater Vancouver: +7.9% y-o-y; Fraser Valley: +13.9% y-o-y), the trend appears poised to accelerate later this summer as price declines last year fade further in the rear view mirror. Meanwhile, y-o-y benchmark home price increases were running just below 20% in Victoria and elsewhere on Vancouver Island. Benchmark price gains slowed on a y-o-y basis in Greater Toronto, Mississauga, Guelph, and particularly in Oakville-Milton but remain well above year-ago levels (Greater Toronto: +25.3% y-o-y; Guelph: +25.4% y-o-y; Oakville-Milton: +17.4% y-o-y). Calgary benchmark prices remained slightly positive on a y-o-y basis in June (+0.6%), while Regina and Saskatoon home prices came in below year-ago levels (-0.7% and -3.1%, respectively). Benchmark home prices rose by more than the rate of overall consumer price inflation in Ottawa (+5.2% overall, led by a 6.2% increase in both one and two-storey single family home prices), Greater Montreal (+4.2% overall, led by a 6.9% increase in prices for townhouse/row units) and Greater Moncton (+4.7% overall, led by a 10.6% increase in prices for townhouse/row units). The MLS® Home Price Index (MLS® HPI) provides the best way of gauging price trends because average prices are prone to being strongly distorted by changes in the mix of sales activity from one month to the next. The actual (not seasonally adjusted) national average price for homes sold in June 2017 was $504,458, up just 0.4% from where it stood one year earlier. The national average price continues to be pulled upward by sales activity in Greater Vancouver and Greater Toronto, which are two of Canada’s most active and expensive housing markets. Excluding these two markets from calculations trims more than $100,000 from the national average price ($394,660).